Left on Houston sweater. Piper Gore pants. Sam Edelman shoes. ShopLately cuff. Wednesday Collection ring via StyleSays. 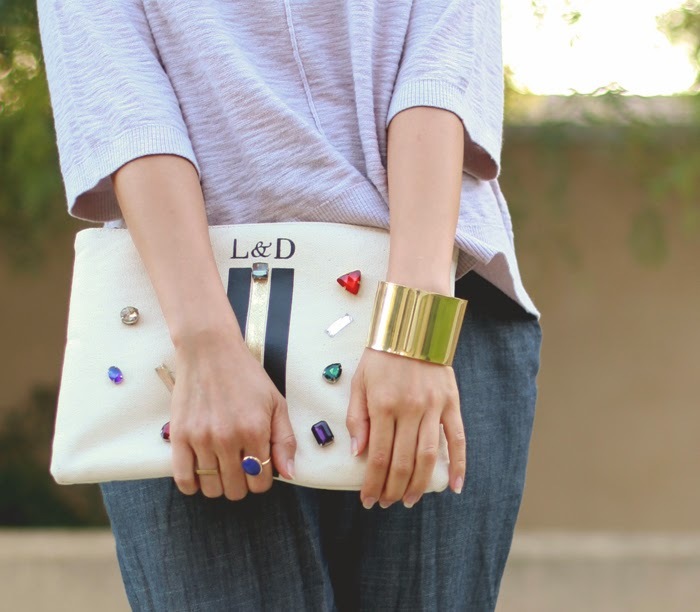 DIY Line & Dot clutch. My personal favorite reward of working from home is getting to work wherever I please. I can pack my laptop and go sit down at Bottega Louie for some macarons at 10AM in their beautiful cafe or go to the Starbucks in downtown Laguna Beach to work while overlooking the wide ocean and enjoy the peaceful lack of tourists. But an even simpler spot I frequent is just the courtyard right outside my front door. It's a fresh and easy escape from the desk in my humble-sized room that doesn't get much natural light (which doesn't work for a total sun worshipper). So most mornings I step outside and welcome the crisp air and the fresh smell of Autumn and say hello to my neighbors, which is nice when the most personable contact I get is through the computer during the week. And so these mornings require the comfiest of wear and my Sam Edelman slipper flats are the perfect relaxing pieces for my feet. I love the chic studded detail and the fact that it's super cushioned inside, so my feet feel like they are tucked into pillows. At least they get to still stay in bed while I work. Cute look! I love the pale colors and how it looks like a comfy outfit! hahaha, it totally takes a lot of diligence and self-control! But I wouldn't have it any other way :) And I totally agree, I find myself so much more productive with nothing but a laptop and tea in the cafe.